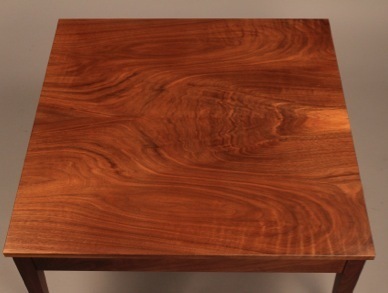 This coffee table is handmade of solid walnut and is 36” x 36” x 18” ht and is currently for sale. The spectacular walnut top is book-matched and has both figure and crotch sections in the wood that create art like patterns. This table is solid, it is made with mortise and tenon joinery for it’s unmatched strength. 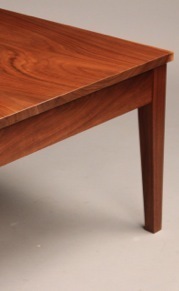 The table surfaces are hand planed to give it the clarity and crispness that can only be delivered with a sharp edge. This coffee table like all the furniture we make is made to stand the test of time for durability and will become a valuable family heirloom that can be used and enjoyed for generations to come.